On the top shelf I have all my jumpers and skirts folded. Then I have some going out bags, pajamas and bikinis that I don’t need for everyday at the real back. Everything else is hanging, folded in my chest of drawers or out by the shoes. 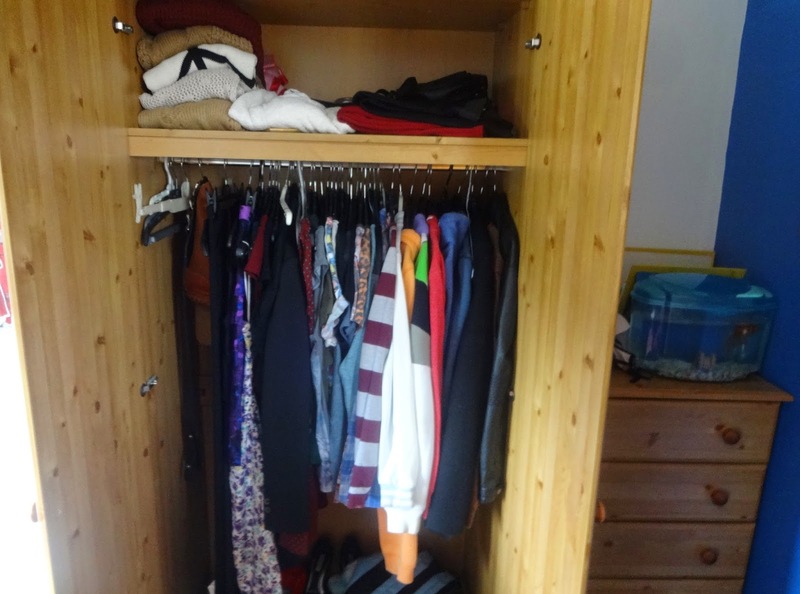 The fist section of hanging clothes is all my jackets, hoodys and sweatshirts. Then I have my two checked shirts. After that I have some hanging long sleeves tops, and the I have all of my t-shirts and dressy tops. After that I have my casual everyday dresses. After my casual dresses, I have interview or generic work clothes if I ever need them and then I have all my going out dresses. After that I just have my belts. In the chest of drawers, which I didn’t photograph, I have a drawer for underwear, a drawer for pajamas, a drawer for all my tank-tops and then a drawer for all of my pants or jeans. Before, I used to have half my pants hanging and half folded in different drawers so I never knew what pants I had to wear. This system is so much better. After I organised the chest of drawers, I realised that I had nowhere to put my gym clothes; all my sweat pants, leggings and tops. I borrowed a small travel set of drawers from my sister who doesn’t live at home anymore to put my gym clothes in. I put this in the hall outside my room with a shoe rack that my sister also gave me. I organised all my shoes on the shoe rack but unfortunately my heels are too small to put on it. They fall right through the bars. So that is my new way of organising my clothes and shoes, and believe me it is so much more easier to navigate than the old way. I think the best way to organise is to group everything by what it is. If you have all your trousers together and all your tops together then you know exactly where to go when putting an outfit together. 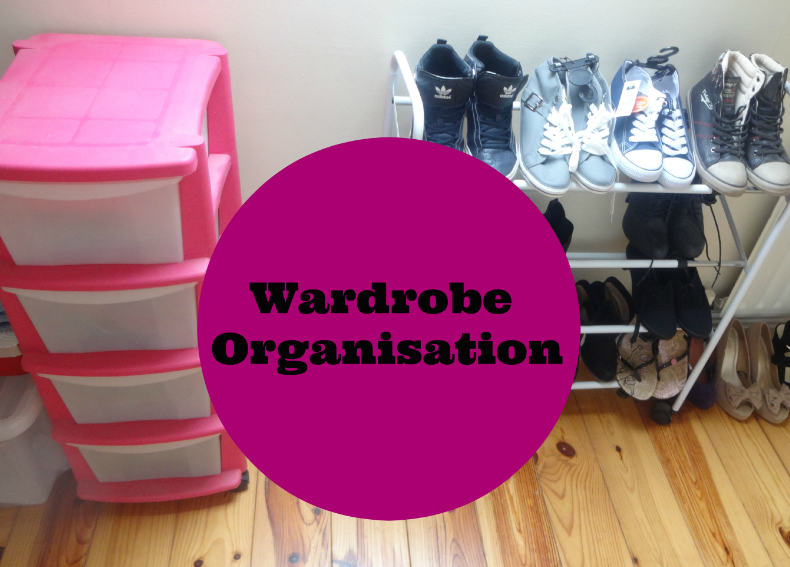 I hope you liked this post and it inspired you to organise your wardrobe. Let me know in the comments below what way you like to organise your wardrobe or if you wardrobe is a total mess that you don’t even want to attempt to tidy. I’ll talk to you soon.